So, here I am, sitting in front of my computer, writing an article for the Lesley Public Post. Who would have thought that I would ever be doing something like that? At age 49, I am completing my Bachelor’s Degree. I know that for many of you, 49 must sound very old. However, the interesting thing about age is that you only look older, but you actually still feel exactly the same– at least I do. Yes, I most definitely have more life experience, but the feeling that I have about myself is still the same I had when I was in my twenties. Well, once you get to my age, you will know what I mean. I am taking two courses per semester, which is considered studying part-time; and now that I have started, I wish I could just do this full-time. It is so much fun! I feel so invigorated and proud of myself – even though it took me a while to get to that point. I went back and forth before I finally registered. I kept wondering how to make the time. Being a single mom with an 11 year old son and an extremely active dog at home, I just did not know how I could possibly fit studying into my daily schedule. And I really had no clue what to expect. I grew up in Germany and after finishing high school, I completed a three year vocational training in the hotel business. Afterwards, I attended a private school to obtain a degree in European Office Management. I have never attended a university… until now. When I finally found the classroom I had just missed all the introductions. It was only a small group of students, all much younger than me. Did I belong here at all? Was this really what I wanted to do for the next two to three years? Our instructor handed out the syllabus and I started reading through the assignments. Honestly, I felt completely overwhelmed. What does all this mean? There were so many terms that I was not familiar with. But then I heard one of my classmates voicing my thoughts. She also felt overwhelmed, so this made me feel a little better. I was not the only one! The course turned out to be the best course I could have taken to begin my studies. We learned so much about ourselves and shared so many experiences. We talked about aspects of our socio-cultural perspective and how they influenced our professional identities. A lot of self reflection was necessary in order to complete the assignments, and we had many interesting discussions in the classroom. This was exactly what I needed! The new knowledge I gained in this course helped me to see more clearly why people, myself included, make certain choices. It helped me to get confirmation that going back to college definitely was the right decision. It is never too late for a new beginning. All my doubts got wiped away pretty quickly. The professor was very helpful and always available for questions. The more I worked on assignments the more comfortable I got with my new routine. I am so glad, I chose this course, and I am thankful that my advisor guided me in this direction! The second course I chose is a Writing Workshop. We are practicing many different writing styles like analyzing essays, writing a blog or composing an article for the Lesley Public Post – which is what I am doing right now. In only seven weeks I have learned so much already. Our professor makes the course really interesting and fun. Even though it is an evening class, I never get tired of listening to her. Let me conclude with an observation: Even though I am happy and proud of myself to have made the decision to go back to college, and I know that I am an inspiration for other older students, I believe that it is best to begin your university education as early as possible. I wish I had done that, in fact. It is just so much easier when you are younger and you do not have too many obligations yet. No need for a nanny, no juggling between parenting, working part-time and trying to make time to study. Getting a degree when you are young will give you a good head start. But even though it took a while for me to get here, as far as I am concerned, better late than never! This is the path to a completely new beginning for me. It is never too late to learn something new. I am very happy and proud to be part of LCAL, and part of the Lesley community! 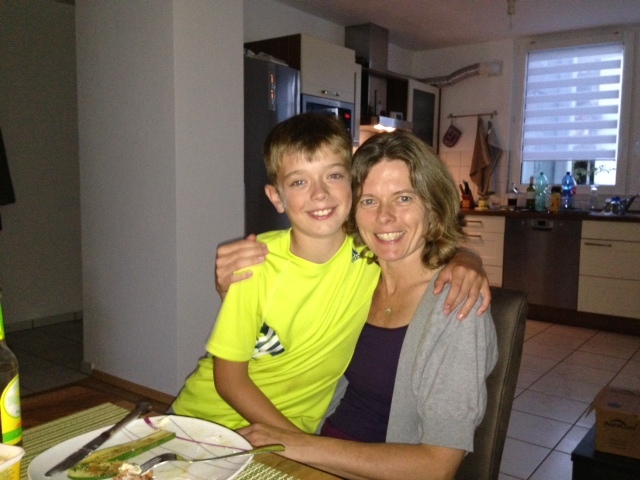 Below is a photo of the author with her 11-year old son Gabriel. Thank you so much for this candid and positive sharing of your academic experience in your first semester here at Lesley! When I think back to our Lives in Context course, you were the teacher for all of us in many ways through the very insightful contributions you made based on your rich personal and professional life experiences. I loved reading every word of this wonderful article, and I wish you continued success in your educational and professional pursuits. Welcome to the LCAL program. You will see that there is a lot of support within the Lesley Community to help you succeed in reaching your goal and beyond. Thank you for writing this piece. I admire your dedication to succeed and I am happy you are finding support at Lesley and have chosen to return to college. I, like you, am also a single mother studying to finish my bachelors degree. I started at Lesley last fall of 2014 while I was pregnant and just joined the LCAL program two weeks ago. I have found Lesley to be a very supportive environment and a college where I feel welcome each day. I have also had the opportunity to be taught by so many amazing professors that have shown deep commitment and love for each student and what they are teaching. Since my son was born, I have often needed to bring him with me to campus; during my tutoring sessions or meetings with various faulty. I have found both the students and faculty to be extremely warm and welcoming to both myself and my son. The first time I was preparing to walk into school with my son this past fall, I felt afraid because I was just starting to find myself in a new identity as a 23 year old college student and now as a mother to an amazing little boy. Later as I left school I cried, because the only response that I received from the other students were smiles and I felt that although all else was up in the air, Lesley still remained a loving and stable place for the two of us. I am almost a junior, but as I am sure you know, being a mother and especially a single mother, timing is always something that needs to remain flexible. I admire your determination. I myself have that determination to succeed- as what I do now not only affects myself but the future that I want for my son. I truly believe that Lesley will help us to get there. I really enjoyed your piece and I would love to speak with you sometime. My son is named Gabriel as well, he is almost 10 months old. I wish you nothing but success. Anita, thank you so much for sharing the story of your journey and for your friendship! This is so inspirational, as I a fellow “AARP” member embark upon this endeavor. I see us spending quite a bit of time between Nashoba Brook Bakery and Acton Coffee House! I realize you wrote this quite some time ago; I hope you still find my comment! I wanted to thank you for sharing this article. It was validating and empowering to read of someone who is alongside me in the journey at Lesley. I also live in Concord and am a single mother of two. I began Lesley about a year ago. In the day to day of keeping up with the kids and work and school I forget that there are people like you(us) doing the same thing out there alongside me! Beautiful. Thanks again.